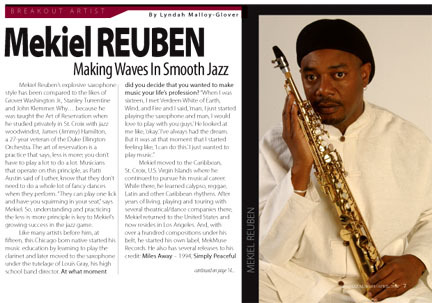 Mekiel Reuben’s explosive saxophone style has been compared to the likes of Grover Washington Jr., Stanley Turrentine and John Klemmer. Why… because he was taught the Art of Reservation when he studied privately in St. Croix with jazz woodwindist, James (Jimmy) Hamilton, a 27-year veteran of the Duke Ellington Orchestra. The art of reservation is a practice that says, less is more; you don’t have to play a lot to do a lot. Musicians that operate on this principle, as Patti Austin said of Luther, know that they don’t need to do a whole lot of fancy dances when they perform. “They can play one lick and have you squirming in your seat,” says Mekiel. So, understanding and practicing the less-is-more principle is key to Mekiel’s growing success in the jazz game. Like many artists before him, at fifteen, this Chicago born native started his music education by learning to play the clarinet and later moved to the saxophone under the tutelage of Louis Gray, his high school band director. At what moment did you decide that you wanted to make music your life’s profession? He looked at me like, ‘okay.’ I’ve always had the dream. But it was at that moment that I started feeling like, ‘I can do this.’ I just wanted to play music.”Mekiel moved to the Caribbean, St. Croix, U.S. Virgin Islands where he continued to pursue his musical career. While there, he learned calypso, reggae, Latin and other Caribbean rhythms. After years of living, playing and touring with several theatrical/dance companies there, Mekiel returned to the United States and now resides in Los Angeles. And, with over a hundred compositions under his belt, he started his own label, MekMuse Records. He also has several releases to his credit: Miles Away – 1994, Simply Peaceful – 1996, Shadows of Love – 2000, and his latest release, Hanging in the Moonlight – 2005, a fantastic musical experience. “Hanging in the Moonlight reflects my smooth jazz side with a splash of Caribbean flavor. I wanted the listener to feel as if they were being guided on a journey from my United States jazz roots to my fruitful life in the Caribbean, and I think I accomplished that with this album. ”Over the years, Mekiel has shared stages with a lot of noted musicians at festivals and concert venues throughout the U.S., Canada, and Europe. Artists like Bunny Wailer, Ziggy Marley, Maxi Priest, The Jazz Crusaders (The Crusaders), Phil Perry, Marcus Miller, Chaka Khan, Etta James, and George Clinton and the P-Funk, just to name a few. In 2002, he joined Ike Turner and the Kings of Rhythm touring most of the major European and North American Blues and Jazz Festivals that year … and recorded Live in Montreux – the Resurrection of Ike and the Kings of Rhythm album on the French label, Isabel Records –Blues Power series.Mekiel Reuben does not spend all of his time performing at Jazz and Blues festivals. For over twenty years, he has given his time and talents at LAUSD and Benjamin Banneker Special Education Center in Los Angeles, California. He also plays an annual smooth jazz concert for Black History month at the center and has brought much joy to disabled students with music for over a decade.So, check him out. Mekiel plays regularly on the Jazz or Reggae circuit and was one of the finalists to receive an award from the 2006 Temecula Valley International Film and Music Festival for TOP MUSIC ARTIST out of over 400 entries. Keep your eyes open and your ears tuned to catch this rising star.